I have been thinking about making the ultimate winter bike. Here are some of the things that I have been thinking about. What else would you think about when building a good winter bike. I am specifically building this bike for Ottawa, Ontario, Canada. The average January temperature is -10°C (12 °F) but it can get as cold as −30 °C (−22 °F). I am interested in making a bike that will ride well in both urban and more rural areas. It should be able to handle snow and ice. Road frames generally have less clearance for wide tires, mud guards etc. Even when the roads are mostly clear in the winter I often encounter snow filled streets and icy patches. 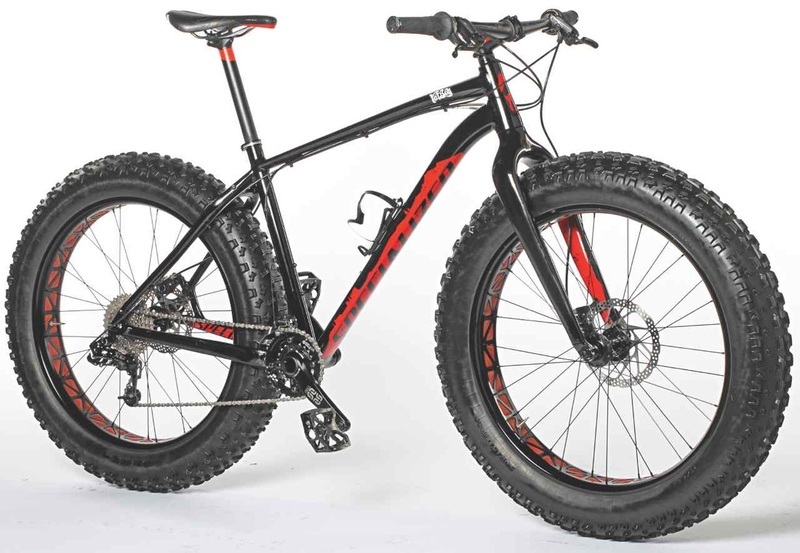 I am leaning towards a mountain frame because I think that it would be better suited to this kind of semi-technical riding. I have never used drop bars in the winter before I really liked having a long handle bar. I found that this really helped to balance on slippery roads. Seems like if you want drop bars it is best to start with a road frame because adding drop bars looks like a pain. Corrosion - An aluminum frame will hold up better than a steel frame in the winter. I think that the salt will do a number on steel, aluminum should hold up better. Last winter I decided that I want to get a new fork this winter without suspension. In the summer I feel totally comfortable jumping off ledges on my bike. In the winter I would not want to jump off anything that required suspension because in winter it is too hard to guess what the traction will be like when landing. I also found that my suspension froze so even if I had wanted it it would not have helped. Studs help grip on ice but will not help in snowy weather. Wide tires help to float the rider on top of the snow. If you want to have really wide tires you need to get wider rims. You can find rims up to 44m wide. I love my disk brakes. They are very reliable and I trust them. I have not used rim brakes in the winter but I know when they get wet they grip less well. Since I want no suspension and disk brakes it is tricky to find a fork. In Ottawa the sun can set as early as 4:30. To see and be seen serious lights are required. Last winter I did not use mud guards. I found generally everything was frozen so I did not get too wet. I think after I remove my suspension I may add some. What else would you think about when building a bike for the winter? I am hoping to get a used frame and used parts when possible and make the studded tires. Good for you, to think of riding as a year-round activity. I would choose an older steel frame (Specialized Rockhopper from 1994?). Steel is very durable, and the older frame is less to be worried about with salt. Put a little FrameSaver on the insides, and don't worry about it. (I'm not an expert on these, just a Grant Petersen fanboy). a plentiful toolkit, including a multitool, pump, and spare tube. The trick to rim brakes in the wet is to dry them out before you need them. When you anticipate a need to stop (approaching a driveway or intersection, for example), lightly apply the brakes. After one rotation of the wheels you'll have most of your braking power back. After a second rotation, they'll be in great shape. For you, not the bike: goggles to protect eyes. My eyeglasses do not stop my eyes from tearing on cold days or fast rides. Weak sunglasses can help reduce the glare from oncoming headlights. Your list looks pretty good and I'm in Ottawa as well. Would you prefer something with derailer, hub geared, or single speed? The ultimate frame for a winter ride would be titanium because it won't rust or more importantly, corrode from salt. But that will cost you 800-900+. That being said I'd agreed the aluminum is likely the best overall price/performance balance. Titanium is only cool if you have a proletariat's privilege. Lasco 46T Crank "used" but really new for 30 bucks from a local shop (I think it's steel alloy so should rust and need replacing in years to come) Will go aluminum next. Studded spare wheel ready for the odd extreme ice days. The bike should run me 300-350 once all is done and well under 20 lbs, likely 17 or so. I'll be going with linear brakes like Avid 5s with special pads this winter due to cost, familiarity and maybe adventure of squirreling around with some skill. I'd like to go disc, but I'm on a Canadian peasant budget. I might go disc on the rear if I find a cheap set...this would be ideal. For warmth, I'm planning on dressing for skiing, so fleece face bandana, ski goggles, have 2 layer bike gloves, tuque and ski jacket with hood and waterPROOF pants above fleece pants. I'll be using my rear pannier bags to store my change of clothes and add a little weight traction to the rear. Jacket and pants both have venting, which helps the hot body core, as skiing and cycling have taught me can be an issue. I would actually recommend a cyclocross or touring frame. In my experience, skinnier tires cut through snow a bit better and you end up with a tire that's actually touching the pavement instead of riding on top of a layer of snow. With a cyclocross or touring frame, you'll have enough clearance for cyclocross tires with a little bit of lug to them (you don't want regular slicks), fenders, racks, and whatever else you want to do. You can also set it up with either drop bars or risers, just make sure to get the appropriate brake setup for whichever bar you choose. A cyclocross frame would solve your disc brake problem too. Disc brakes are becoming standard on cyclocross bikes. You see them on touring frames too, but not as often. As I understand it, they make it harder to mount racks but I don't have any hands-on experience with that. I live in Ottawa as well, seems as though there are a few of us here. My best recommendation after riding until end of December last year when the snow came is to get a bike that you don't care if it gets rusted out. With all the salt they put down here, the drive train is going to get destroyed and you will probably want to have a new drive train (or many new parts) each winter. My freewheel cassette no longer freewheels after riding it until last December (was planning on a new bike anyway). Unless you are in a particularly hilly section of the city (there aren't many) I would probably go with a single speed or fixed gear as there's just less parts to replace next time around. I got a cheap fixie off Kijiji that I plan to use until the snow comes. There's another cyclist around my office complex who rode all winter last year and he has single speed as well. The frames seem to hold up well enough either with aluminium or steel, but the drive train and any kind of bolts seem to undergo a terrible amount of corrosion. You might want to cover all the bolts in a layer of grease. It will make working on it a little messier, but will protect them from the elements a lot more. In that sort of environment I would be looking for minimal external parts - something like a kona dr good? What else would you think about when building a bike for the winter? I got flat tires twice, when commuting in summer (on the bike's original 700x32 tires). I changed the tires to Marathon Plus, and haven't had another flat since. Getting a flat tire wasn't a big deal for me because I was cycling near public transport routes; but especially if you're "in both urban and more rural areas", consider getting tires that you can really depend on: the tires seemed to me to be the least reliable part of my bike. This sounds like a perfect job for a Fatbike! Those bikes were made for such conditions you describe. You have tires you can run with really low pressure (for more traction in the snow). You can have your mountainbike frame and disc brakes. In my opinion you even don't need a suspension with such a bike, the low pressure in your tires is really enough comfort and suspension. If you ride more rural and snowy roads it can be really fun with such a bike! And actually most of the "big players" in the mountainbike sector have their own model. I'd suggest a cyclocross (CX) frame over a mountain bike. CX frames have wider stays to take wider tires, and most have fender/pannier mounts. A CX frame can be lighter than a mountain frame, and most are made to be packed on the shoulder if necessary. Disc brakes on CX frames are a lot more common now - mechanical for the most part, more hydraulic options within a year or so (and frames are typically setup to handle either). Road forks are unsuspended, and it's easy to find disc forks -- chromoly are available, cheap, and heavy. If corrosion is a big concern, titanium makes the ultimate winter bike. No corrosion concerns, strong as steel and comparable weight aluminum (if not better). I don't see an issue with lights -- most seem to use o-rings to attach, so they can be taken off easily if need be. 1) winter could be a very cold season - take extra clothing! 2) during winter months the daylight time is shorter than in summer -> take extra flashlight! Not the answer you're looking for? Browse other questions tagged winter build or ask your own question. How does the length of the studs on winter tires affect traction on ice? Widest tire on a 23c rim?